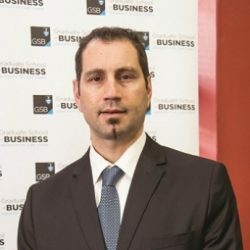 Rayner Canning is the Director of Business Development at the GSB where he leads the Business Development Unit to develop and support new and existing business for the GSB to ultimately increase market share and revenue. Rayner’s primary focus is to identify, develop and retain key customized executive education clients to ensure that the GSB serves the corporate world and society as a whole. He is also responsible for a number of externally focussed GSB departments such as Admissions, Alumni Relations, Careers Services, Business Development, Marketing and GSB-Johannesburg (the GSB’s Executive training facility in Sandton) and works closely with Executive Education and Faculty to exceed client expectations. Before heading up the GSB’s Business Development Unit, he was the GSB’s Finance Director for 8 years, exercising joint accountability (with the GSB Director) for full range financial and business functionality of the GSB and BWL. He also worked at UCT’s International Office for 6 years, exercising joint accountability (with the International Academic Programmes Office Director) for full range financial and business functions for the unit. In 2016 he presented a conference paper at an AACSB conference in Milan, Italy on the topic “Financially Innovative Strategies that Support Change and Innovation in Business Schools”. With a background in Finance and Taxation, Rayner has successfully developed a number of new business initiatives for UCT GSB. Most recently Rayner has overseen the end-to-end process of opening a new remote campus, some 1500 KM’s away in Johannesburg. This project involved the conceptualizing of the new campus, site identification, lease negotiations, financial feasibility studies, development of a 5-year integrated strategy, presentations to a range of stakeholder committees for approvals, project oversight for the fit-out, appointment of new staff and successfully launching and operating the campus. He has also overseen the development of an integrated commercial, financial and operational strategy in formulating and delivering a successful UCT GSB Conference Centre business plan and proposal (new build worth R127 million). Rayner has shown collaborative and innovative approaches to complex customized executive education tenders, proposals and negotiations with corporates, multinationals and SOE’s (state-owned enterprises) and has with his team brought a number of new clients to the GSB. Rayner holds a Masters of Commerce (MCOM) from the University of Cape Town Graduate School of Business, a PGDip in Tax Law and a BCOM (Accounting) from the University of Cape Town.